Teen Titans Go! (2013) : Série TV de 4 saisons et 209 épisodes diffusée sur Cartoon Network. Casting, acteurs, bandes annonces et actualités. Rejoignez la joyeuse bande de Robin, Starfire, Beast Boy, Raven et Cyborg ! Quand ils ne combattent pas les super-vilains, ils tentent d'organiser la fête de la boulette ou de partir en quête du sandwich parfait en contrant les attaques monstrueuses de pizzas géantes. D'autres aventures savoureuses et pimentées au menu de Teen Titans Go ! Hummm, de la régalade et de la rigolade en barres ! Casting de la série "Teen Titans Go!" S01E02 Pie Bros 23/04/2013 Beast Boy gets a job at a pie shop in order to buy Cyborg a birthday gift. S01E04 Dog Hand 30/04/2013 Raven's dad cozies up to her friends in hopes of luring her over to the dark side. S01E05 Double Trouble 07/05/2013 Cyborg has Raven create doubles of himself and Beast Boy. S01E06 The Date 07/05/2013 To go on a date with Starfire, Robin kidnaps Speedy. S01E08 Laundry Day 14/05/2013 Later, chores pile up while the team bicker, and soon their dirty uniforms go on the offensive. S01E09 Ghostboy 21/05/2013 Beast Boy pretends to be a ghost haunting Starfire so she will do his bidding. When she figures out the ruse, she and the other Titans convince Beast Boy that he's actually dead. S01E10 La Larva de Amor 28/05/2013 Robin, Cyborg, Beast Boy, and Raven agree to take on the responsibility of babysitting Silkie while Starfire is away. S01E11 Hey Pizza! 04/06/2013 Cyborg and Beast Boy try to capitalize on Zippy's Pizza's "thirty minutes or its free" deal, but the delivery boy is seemingly unstoppable. It becomes a bit of a challenge as an all-out war of wits between them erupts. Meanwhile, Robin struggles with whether to build a senior center or a pool (leaning toward the pool mostly to see Starfire in a bikini). S01E12 Gorilla 11/06/2013 Beast Boy turns into a loud, obnoxious gorilla and refuses to change back driving Robin crazy. Gorilla Beast Boy takes over the leadership of the Titans leading to chaos ranging from not letting a girl get onto Beast Boy's monkey bars, fighting crocodiles, and freeing captive gorillas from the zoo. Cyborg teaches Robin how to be an alpha male so he can take back his role as leader of the Teen Titans. S01E13 Girl's Night Out 18/06/2013 When Robin, Cyborg, and Beast Boy won’t let Starfire and Raven come along on their "Boys' Night Out," Starfire and Raven spring Jinx from prison and the three of them have a wild night of their own. S01E14 You're Fired 25/06/2013 Beast Boy's behavior causes him to be fired from the Teen Titans and replaced by a pair of shape-shifting twins. S01E15 Super Robin 02/07/2013 Envious of the other Titans' superpowers following their fight with the H.I.V.E. Five (consisting of Mammoth, Gizmo, Jinx, Billy Numerous, and See-More), Robin wants some of his own. After a disastrous scientific experiment goes awry that merges him with the DNA of the American Robin, he convinces Raven to use her magic to give him superpowers even though she claims that superpowers are a curse. S01E16 Tower Power 09/07/2013 Cyborg plugs into the control panel of the Titans tower and drives the others crazy. S01E17 Parasite 16/07/2013 Starfire's new pet is a horribly dangerous parasite, but Robin is the only one who is suspicious of the beast. S01E18 Starliar 23/07/2013 Beast Boy teaches Starfire how to lie and it backfires as her lies get more and more outrageous. S01E19 Meatball Party 30/07/2013 Raven eats a bad meatball that causes tentacles to spring from her teeth and devour the other Titans. S01E20 Staff Meeting 13/08/2013 When Robin's long bo-staff is accidentally broken by the other four Titans, he seeks a new one at the mystical Tree of the Universe. S01E21 Terra-ized 20/08/2013 When Beast Boy believes that Terra is his new beloved sweetheart and girlfriend, Raven is suspicious of her true motives. S01E22 Artful Dodgers 27/08/2013 The Titans believe they will win an upcoming dodgeball championship. S01E23 Burger vs. Burrito 03/09/2013 Cyborg and Beast Boy are in perfect sync, except when it comes to their taste in food. What’s the best food ever created, burgers or burritos? The two friends have an all-out competition to settle things once and for all. S01E24 Matched 11/09/2013 Cyborg’s Love Matcher 5000 program pairs Raven with Beast Boy and Starfire with Aquaman. While Beast Boy does everything he can to get Raven to love him, Robin tries to be more like Aquaman to win Starfire’s heart. S01E25 Colors of Raven 18/09/2013 A magical prism causes Raven to fragment into five distinct personalities which wreak havoc around town until the other Titans can figure out how to rejoin her. S01E26 The Left Leg 25/09/2013 When the gang bands together to form a giant robot, Robin is relegated to the left leg, but he makes the left leg count! S01E27 Books 02/10/2013 The Titans discover the wonders of reading, but after opening a book that brings their thoughts to life, they must fight against their own imaginations! S01E28 Lazy Sunday 09/10/2013 Cyborg and Beast Boy love lazy Sundays sitting on the couch … even when it’s a Tuesday! But when Robin replaces the couch with a treadmill, the two lazy teens must embrace the new active lifestyle. S01E29 Starfire The Terrible 16/10/2013 When Robin needs an archenemy, Starfire generously offers to fill the role and she exceeds expectations. S01E30 Power Moves 23/10/2013 When Robin starts doing power moves with Cyborg, Beast Boy gets very jealous. S01E31 Staring at the Future 30/10/2013 Cyborg and Beast Boy have a staring contest that lasts 30 years, bringing them face to face with a future of adulthood and responsibility… and they hate it. S01E32 No Power 06/11/2013 Feeling the other Titans depend too much on their super powers, Robin challenges them to go 24 hours without using their powers. To his distress, they all succeed, leading him to question his own value to the team. S01E33 Sidekick 13/11/2013 Robin gets called back to the Batcave but only as a house-sitter while Batman’s away. S01E34 Caged Tiger 20/11/2013 Cyborg, Beast Boy, and Robin return from a Bro-cation closer than ever, but their bro-mentum is interrupted by Dr. Light! S01E35 Second Christmas 04/12/2013 The Titans trick Starfire into believing in second Christmas with a second Santa. S01E36 Nose Mouth 08/01/2014 Raven's past powers may cause consequences to the other Titans. S01E37 Legs 15/01/2014 After Robin swipes her cloak, Raven's leggy figure is revealed and she transforms into Lady Legasus. Meanwhile, Cyborg gets stuck in the discarded cloak, revealing a dark side of his personality. S01E38 Breakfast Cheese 22/01/2014 Starfire convinces the reluctant Titans to try defeating their enemies with compassion rather than violence. S01E39 Waffles 05/02/2014 Cyborg and Beast Boy show their love of waffles by making it the only word they say, much to the annoyance of the other Titans. S01E40 Be Mine 12/02/2014 It's Valentine's Day, and the Titans are throwing a dance. Beast Boy knows who he wants to go with, and thing is... he wants to go with Terra, his ex-girlfriend, who already made a crack at eliminating the Titans. S01E41 Opposites 19/02/2014 Cyborg has a crush on Jinx. S01E42 Birds 26/02/2014 Robin removes two mockingbirds from the chimney with a gas he created in his lab. But the chemical mutates the birds into muscular bullies who then move into the tower. S01E43 Brain Food 05/03/2014 Beast Boy is tired of being the least intelligent of the Titans. When all of his efforts to get smart fail, he uses Raven's spell book to cast a spell - not to make him smarter, but to make all of the other Titans dumber. S01E44 In and Out 12/03/2014 Robin infiltrates the H.I.V.E. Tower to destroy it, but instead he is distracted by its awesomeness! S01E45 Little Buddies 19/03/2014 Cyborg wants Pain Bot to be his "little buddy" but is the destructive robot too dangerous to be a sidekick? S01E46 Missing 26/03/2014 Killer Moth offers a reward for Silkie's return, but will Silkie be happier away from the Titans? S01E47 Uncle Jokes 09/04/2014 Starfire is allowed to join Beast Boy and Cyborg's revelry, if she avoids uncle jokes. S01E48 Mas Y Menos 16/04/2014 Robin tries to teach Spanish-speaking brothers his superhero ways. S01E49 Dreams 23/04/2014 The dream worlds of the Titans. S01E50 Grandma Voice 30/04/2014 Cyborg is possessed by a "Grandma Voice", which irritates the Titans. S01E51 Real Magic 14/05/2014 Robin dabbles with magic, ignoring Raven's warning that he will anger the magic god. S01E52 Puppets Whaaaaat? 05/06/2014 Robin makes a deal with a sock puppet which turns him and the other titans into puppets. S02E02 Man Person 19/06/2014 Despite the Titans' protests, Beast Boy becomes convinced that replacing his body parts with robotic limbs makes him more manly. S02E03 Pirates 26/06/2014 Aqualad asks Raven out on a date, which makes Beast Boy jealous. Cyborg tries to prove that Aqualad is really a pirate. S02E04 Money Grandma 03/07/2014 When Robin starts a smear campaign against all of the other Titans so that he can be re-elected Team Leader, Raven uses a time machine to bring a great leader from the past to teach Robin how to lead. S02E05 I See You 24/07/2014 Robin brings Starfire on a fake stakeout in an attempt to get a kiss, while Cyborg and Beast Boy hold their own stakeout to discover Raven's dark secret. S02E06 Brian 31/07/2014 When the Brain captures the Titans to fuel Project B.R.I.A.N., the Titans' little buddies are the only heroes who can save them. S02E07 Nature 07/08/2014 When Beast Boy loses his ability to change into animals, he realizes that he’s lost touch with his wild side. He goes to the forest to reconnect with his inner beast, but Mother Nature isn't as great as he had hoped. S02E08 Salty Codgers 14/08/2014 Raven is delighted when the other Titans are magically turned into old people during a battle. S02E09 Knowledge 21/08/2014 Starfire wants to learn more, but will knowledge make her a bummer? S02E10 Slumber Party 28/08/2014 When the other Titans find out that Cyborg is afraid of the dark, they have a slumber party to help him face his fears. S02E11 Love Monsters 04/09/2014 Raven warns the Titans not to go near a box containing the Twin Destroyers of Azarath. Starfire can't help it and opens the box, giving hugs and snuggles to the tiny and adorable destroyers... but love only makes the destroyers stronger. Now, the Titans must find a way to get the monsters back in the box before Raven finds out that they were released. S02E12 Baby Hands 11/09/2014 Robin has been hiding something under his gloves. S02E13 Caramel Apples 18/09/2014 Raven and Starfire clash after Starfire creates a bond with Raven's father, while Robin, Cyborg, and Beast Boy struggle to return to Earth's surface after falling into a deep cavern. S02E14 Sandwich Thief 25/09/2014 Robin's perfect sandwich is missing and he will stop at nothing to find it. S02E15 Friendship 02/10/2014 When Control Freak imprisons the Titans in a Pretty Pretty Pegasus world, the Titans decide to use violence to escape, while Raven decides to use friendship and happiness. S02E16 Vegetables 09/10/2014 When the team tries to live a vegetarian lifestyle, they learn that living that way is not for everyone. S02E17 The Mask 16/10/2014 Robin's mask hides both his secret identity and a horrible secret. S02E18 Serious Business 23/10/2014 When Robin rations bathroom time to five minutes per visit, the other Titans try to show him the magic of the bathroom. S02E19 Halloween 30/10/2014 Raven tries to get the other titans to enjoy Halloween again. S02E20 Boys vs Girls 06/11/2014 The Titans compete against each other to prove who is the better gender. S02E21 Body Adventure 13/11/2014 Cyborg is infected with a cold and the Titans shrink down to fight it off. S02E22 Road Trip 20/11/2014 Cyborg completely rebuilt the T-Car and takes it out on a road trip. S02E23 Thanksgiving 26/11/2014 When Raven’s father Trigon shows up for Thanksgiving dinner, Robin’s seating plan isn't the only thing that gets ruined. S02E24 The Best Robin 04/12/2014 Due to the Titans' laziness, Robin creates another team of himself to battle Brother Blood. S02E25 Mouth Hole 08/01/2015 Robin wants to gain the power of whistling. S02E26 Hot Garbage 15/01/2015 The Titans try to convince Beast Boy to clean his room, but they learn that there is more to garbage than just trash. S02E27 Robin Backwards 22/01/2015 When Nibor, Bizzaro World's Robin, arrives in Jump City, the team decides that they should watch him. S02E28 Crazy Day 29/01/2015 When Crazy Day arrives, Raven tries to avoid being driven crazy by her fellow teammates. S02E29 Smile Bones 05/02/2015 When Cyborg and Beast Boy teach the others to wolf down their food, the group must battle their own obesity. S02E30 Real Boy Adventures 12/02/2015 After transforming himself into 'Fleshy Guy', Cyborg discovers the delight and agony of being human. S02E31 Hose Water 19/02/2015 The discovery of a baby bird fuels Starfire and Cyborg to discover their inner children have been awakened. S02E32 Let's Get Serious 26/02/2015 Robin attempts to make the Teen Titans to be taken more seriously by the real heroes from Young Justice. S02E33 Tamaranian Vacation 05/03/2015 The Titans visit Starfire's home world of Tamaran to try and learn what makes her so sweet and loving. S02E34 Rocks and Water 12/03/2015 Raven and Beast Boy are surprised to discover that their exes, Terra and Aqualad, are dating each other. S02E36 Truth, Justice and What? 26/03/2015 Pizza is the source of the Titans' goofy humor. S02E37 Beast Man 29/06/2015 Beast Boy discovers he can transform into an adult man. S02E38 Oil Drums 09/04/2015 Cyborg is looking forward to a marathon of '80s television shows, but the remote appears to be missing. S02E39 Video Game References 16/04/2015 The Titans immerse themselves into a variety of video game worlds. S02E40 Cool School 23/04/2015 Raven decides to hang out with Rose Wilson because she is cool; the others believe they are lame by comparison so they attend Cool School. S02E41 Kicking a Ball and Pretending to Be Hurt 30/04/2015 The Titans learn about the magic of soccer. S02E42 Head Fruit 07/05/2015 When Beast Boy's head starts to rattle, Robin suggests that he should find a hobby so that his brain will stop shrinking. S02E43 Yearbook Madness 14/05/2015 Beast Boy and Cyborg decide to create a yearbook for the Titans. S02E45 Operation Tin Man 30/06/2015 Gizmo convinces the Titans that he has kidnapped Cyborg, who, in reality, is just hanging out with Jinx. S02E46 Nean 01/07/2015 Raven is cursed to be nice; Starfire prepares to marry a pot of chili. S02E47 Campfire Stories 02/07/2015 In order to improve their time on a horrible camping trip, the Titans each tell a scary campfire story. S02E48 And the Award for Sound Design Goes to Rob 03/07/2015 Raven just wants some piece and quiet for once, and accidentally makes a magical deal that eliminates all sounds. S02E49 The Hive Five 27/07/2015 The Hive decides to take the day off so that they can avoid engaging with the Titans, if it is possible. S02E50 The Return of Slade 28/07/2015 After defeating Slade in an epic battle not seen, Beast Boy and Cyborg want a clown for the celebration, only to find it boring. S02E51 More of the Same 29/07/2015 The Titans go over the basics for New Year's Eve parties to ensure a perfect one. S02E52 Some of Their Parts 30/07/2015 Robin uses the prism to split the Titans into five parts so he can pick out the best ones for the team. S02E53 Cat's Fancy 31/07/2015 Robin is determined to become a cat in order to get Starfire's attention. S03E01 Chat en folie 31/07/2015 Robin is determined to become a cat in order to get Starfire's attention. S03E02 Miss Gambettes 06/08/2015 After a humiliating defeat, Raven and the Titans work on building their lower body strength, becoming the "League of Legs." S03E03 Ruiné de la molaire 13/08/2015 After Beast Boy gets money from the Tooth Fairy, the other Titans try to get in on the action by knocking out their own teeth. S03E04 Le croissant 20/08/2015 After learning looks don't matter, Beast Boy undergoes a metamorphosis through a cocoon, becoming an ugly, gross creature. S03E05 Le piment de la vie 27/08/2015 Having grown sick of Robin's bland cooking, the other Titans make attempts to spice things up. S03E06 La danse des spaghettis 03/09/2015 Stuck inside on a rainy day, the Titans do rainy-day activities to keep from boredom. S03E07 Les Titans à l'école 10/09/2015 When Robin decides to become an all-American class president-type person, he convinces the Titans to return to school with him. S03E08 Craque un cookie 19/10/2015 Robin refuses to give the Titans any more orders so that they'll learn to think for themselves. S03E09 The Fourth Wall 20/10/2015 Control Freak informs the Titans that they are on a TV show he created and demands they earn him an award. S03E10 40%, 40%, 20% 21/10/2015 Cyborg's real strength comes not from his robot parts, but from his favorite song. S03E11 Grube's Fairytales 22/10/2015 Robin tries to teach the Titans valuable life lessons by reading them fairytales, but the others co-opt his stories and spin them into their own twisted yarns. S03E12 Ce procès est une farce 23/10/2015 The titans are brought to court for the destruction they caused to Jump City. S03E13 Les teens fantômes 29/10/2015 The Hive succeed in destroying the Titans, but their ghosts come back to haunt them all. S03E14 Tous des animaux 05/11/2015 Beast Boy's presses the fire button on Cyborg's laser cannon and the Titans die, but Beast Boy puts his blood in them to save them from dying and now have the ability to transform into animals and act like animals. S03E15 L'Anniversaire De Changelin 12/11/2015 It's Beast Boy's birthday, but no one will celebrate it. S03E16 Jour de soldes 19/11/2015 After refusing to shop on Black Friday, Starfire is visited by the ghosts of Black Friday past, present, and future. S03E17 En deux parties (1) 26/11/2015 The Titans visit the Hall of Justice to use the pool, but then decided to check out the inside. S03E18 En deux parties (2) 26/11/2015 The Titans must save the members of the Justice League from the clutches of the supervillan Darkseid. S03E19 Le vrai sens de Noël 03/12/2015 The Titans attempt to infiltrate Santa's workshop to get their names taken off the Naughty List. S03E20 Ras le bol 07/01/2016 The Titans learn about cartoon-style violence while trying to get back a bowl of nuts from a Sqirrel. S03E21 Vide grenier 14/01/2016 Robin makes the other Titans sell their treasured mementos from past episodes. S03E22 Jardin secret 21/01/2016 Cyborg is building stress up, to the point where he directs his built-up rage onto the other Titans. To help calm him down, Starfire takes Cyborg into her own, little secret garden. S03E23 Le monstre à deux têtes 11/02/2016 The Titans go to watch Lebron James at the Wacka Doodles Amusement Park, but find no one is there. S03E24 La Saint Valentin 15/02/2016 It's Valentine's Day and Cyborg goes to great lengths to make it special for his girlfriend Jinx. S03E25 Le systeme pyramidal 15/02/2016 Beast Boy makes lots of money due to a pyramid scheme and convinces the other Titans to join in. S03E26 La Pince 17/03/2016 Beast Boy pinches the other Titans on St. Patty's Day, making them pinch him back, resulting in them all getting curse with bad luck. S03E27 Pâques au Pôle Nord 25/03/2016 The Easter Bunny is missing, and it's up to the Titans to find him before Easter is ruined. S03E28 Poisson d'avril 28/03/2016 The Titans try to outprank each other on April Fools' Day. S03E29 La grande bouteille 21/04/2016 After they are trapped in a giant bottle in their living room, the Titans reminisce to pass the time. S03E30 La leçon 28/04/2016 Robin is able to teach the other Titans a very valuable lesson. S03E31 Concours de détente verticale 05/05/2016 Lady Legasus must stop the League of Legs. S03E32 Obinray 12/05/2016 In order to prevent Robin from eavesdropping, the other Titans begin communicating in Pig Latin. S03E33 Wally T 19/05/2016 Wally T., a fan of the Teen Titans, visits the tower, powering up all the Titans; making them want to get more fans to power up even more. S03E34 Des dar trop cool 26/05/2016 Robin tries to emulate rollerbladers. S03E35 Opération potes à la rescousse (1) 30/05/2016 Part 1 of 2. When Robin, Beast Boy and Cyborg are captured, Starfire and Raven must find extra girl power to rescue them. S03E36 Opération potes à la rescousse (2) 30/05/2016 Part 2 of 2. Female heroes and villains all work together in order to rescue Robin, Cyborg and Beast Boy from The Brain. S03E37 Leçon d'histoire 09/06/2016 Robin tries to teach the other Titans about world history, but they tell their tales of history instead. S03E38 L'art du Ninja 16/06/2016 The Titans must use ninjutsu to get the McGuffin. S03E39 Pensez à votre avenir 23/06/2016 The future Teen Titans travel back in time to stop their young selves from ruining their lives financially and medically. S03E40 TTG VS. PPG 30/06/2016 The Powerpuff Girls follow Mojo Jojo to the Teen Titans' home in Jump City, where he plans to take over the world with an army of monkeys. Beast Boy and Cyborg think Mojo is "pretty cool for a talking monkey", and the girls compete against Robin, Starfire, and Raven to see which is the best superhero team. S03E41 La tarte à la noix de coco 01/08/2016 The Titans are shipwrecked on a desert island and must use the island's resources to survive. S03E42 Protéine pure 02/08/2016 The Titans hold a team competition, but have to avoid an alien hunter. S03E43 Ouvre poliment la porte 03/08/2016 Still shipwrecked on a desert island, the Titans try to find food but stumble upon dinosaurs instead. S03E44 L'île où tout est possible 04/08/2016 Robin eavesdrops on the Titans and grant them wishes to teach them life lessons, but things didn't go as he hoped. 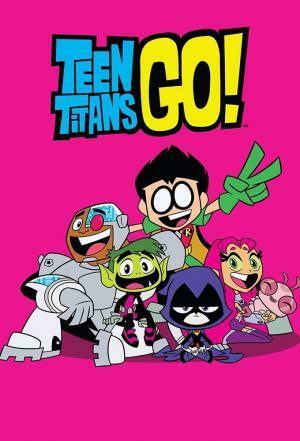 S03E45 Le Titan Show 05/08/2016 The Titans get sick of the island and decide to leave, only to realize that they have in fact been unknowingly press-ganged into a reality TV show by the Teen Titans villains and Control Freak. S03E46 Bouge ton popotin 05/09/2016 In order to save Titans Tower from some wealthy land developers, the Titans search for pirate treasure. S03E47 C'est poilant 08/09/2016 Beast Boy searches for his spirit animal and joins a group of bears. S03E48 La route de l'Oregon 15/09/2016 The group gets into the pioneer spirit on their journey west. S03E49 L'heure du câlin 22/09/2016 When yet another crime alert interrupts their relaxation, the Titans decide to become villains and do whatever they want. S03E50 Eh ouais ! 29/09/2016 Cyborg tells the other Titans that TV wrestling is fake and tries to teach them about real wrestling. S03E51 Chevaucher le dragon 29/09/2016 The Titans are transported inside a fantasy adventure game and must find the key to return home. S03E52 La grimace 06/10/2016 Raven teaches the other Titans how to dance properly but then they are captured by the Dance Demon. S03E53 La cape 13/10/2016 The Titans reminisce about the time they threw a surprise party for Cinderblock. S04E01 Shrimps and Prime Rib 20/10/2016 The Titans try to remember how to be superheroes in order to stop The Brain. S04E02 Halloween vs. Christmas 27/10/2016 When Santa tries to take over Halloween, it's up to the Titans and a few ghouls to stop him. S04E03 Booby Trap House 03/11/2016 Cyborg and Starfire booby-trap the Tower for safety. S04E04 Fish Water 17/11/2016 Starfire wins a goldfish at the carnival and vows to keep it alive. S04E05 TV Knight 26/11/2016 Batman and Commissioner Gordon check in on various happenings around Jump City. S04E06 Teen Titans Save Christmas 01/12/2016 When Santa decides to quit, the Titans pitch in to save Christmas. S04E07 BBSFBDAY! 03/12/2016 Beast Boy agrees to share his birthday with Starfire after learning she's never had one on Earth. S04E08 The Streak - Part 1 27/01/2017 Robin is determined to continue his streak of stopping 52 crimes during crime season. S04E09 The Streak - Part 2 27/01/2017 Robin's streak is in jeopardy when the other Titans are poached by Kid Flash. S04E10 Inner Beauty of a Cactus 03/02/2017 The Titans play Spin The Bottle as Starfire tries to improve her vocabulary through kissing. S04E11 Movie Night 10/02/2017 The Titans have a hard time deciding who gets to choose which movie they watch on movie night. S04E12 C'est ta chanson (1) 20/02/2017 Beast Boy writes a song for Raven to express his feelings, then begins touring with the song, which upsets Raven. S04E13 C'est ta chanson (2) 20/02/2017 Beast Boy writes a song for Raven to express his feelings, then begins touring with the song, which upsets Raven. S04E14 Permanent Record 03/03/2017 It's back to school for the Titans as they teach each other about science and grammar. S04E15 Les titans à la rescousse de l'heure d'été 10/03/2017 The Titans are determined to find out what happened to the missing 2'oclock hour during Daylight Saving Time. S04E16 La saint-Patrick 17/03/2017 It's St. Patrick's Day and after wishing to become a leprechaun, Beast Boy becomes obsessed with gold. S04E17 Le maître détective 31/03/2017 Robin uses his skills as a master detective to discover what happened to the animals that live outside Titans Tower. S04E18 Easter Creeps 14/04/2017 The Tooth Fairy tries to take over Easter. S04E19 Avogodo 05/05/2017 Robin learns that avocados are a super food that can give you super powers. S04E20 Employee of the Month Redux 28/04/2017 The Titans battle a UFO that is snatching cows, while Beast Boy gets a job so he can save up for a moped. S04E22 Orangins 29/05/2017 The Teen Titans each tell their slightly inaccurate origin story. S04E23 Jinxed 09/06/2017 Robin ignores the rules for a game of jinx and ends up losing his voice. S04E24 Brain Percentages 16/06/2017 Beast Boy starts using more than 10% of his brain in an effort to find the hidden images in a puzzle. S04E25 BL4Z3 23/06/2017 The Titans become hackers to stop a gang of computer pirates. S04E26 Hot Salad Water 30/06/2017 When drinking tea turns the other Titans English, it's up to Robin to save America from another British invasion brought by the Queen of England herself. S04E27 Le jour où la nuit cessa d'étinceler et ou elle devint sombre bien que ce fut le jour - Chapitre 1 : Danse avec moi 01/08/2017 Cyborg becomes trapped in the alternate reality of Night Begins to Shine with a dragon who wants to steal the song for his own evil purposes. S04E28 Le jour où la nuit cessa d'étinceler et ou elle devint sombre bien que ce fut le jour - Chapitre 2 : L'histoire dans tes yeux 02/08/2017 Without Cyborg, Beast Boy feels lost and sets out to find himself, but ends up meeting a music legend. S04E29 Le jour où la nuit cessa d'étinceler et ou elle devint sombre bien que ce fut le jour - Chapitre 3 : Tu joues les princesses 03/08/2017 The Titans return to the alternate reality to save Cyborg but will they be able to defeat the dragon? S04E30 Le jour où la nuit cessa d'étinceler et ou elle devint sombre bien que ce fut le jour - Chapitre 4 : La nuit s'allumera 04/08/2017 In a final epic battle, the Titans and their musician friends square off against the dragon for control of the Night Begins to Shine. S04E31 Lication 01/09/2017 Robin introduces the other Titans to a money-making application but they soon learn the dangers of a shareconomy. S04E32 Labor Day 04/09/2017 Robin uses Labor Day as an opportunity to teach the other Titans about the importance of labor. S04E34 Ones and Zeroes 22/09/2017 The Titans build an AI robot so it will create a pizza that's never been made before. S04E35 Career Day 29/09/2017 Batman and Commissioner Gordon have a slumber party and watch their favorite TV shows. S04E36 TV Knight 2 06/10/2017 Batman and Commissioner Gordon have a slumber party and watch their favorite TV shows. S04E37 Quel talent ! (1) 09/10/2017 The Justice League holds a talent competition to find a superhero worthy of joining their team and Robin tries everything to win. S04E38 Quel talent ! (2) 09/10/2017 The Justice League holds a talent competition to find a superhero worthy of joining their team and Robin tries everything to win. S04E39 Costume Contest 27/10/2017 Tired of losing to the Hive Five every year, the Titans hatch a scheme to win the costume contest. S04E41 Throne of Bones 03/11/2017 When the other Titans start listening to heavy metal music, Robin warns them of the dangers. S04E42 Demon Prom 10/11/2017 When Trigon forces Raven to attend her prom, she brings the rest of the Titans along with her to upset him. S04E43 Thanksgetting 17/11/2017 Tired of the normal traditions, the Titans decide to create their own for Thanksgiving. S04E44 The Self-Indulgent 200th Episode Spectacular (1) 24/11/2017 When their world starts disappearing, the Titans must confront their creators. The Titans learn how difficult it is to make a cartoon when they try to animate Michael and Aaron. S04E45 The Self-Indulgent 200th Episode Spectacular (2) 24/11/2017 When their world starts disappearing, the Titans must confront their creators. The Titans learn how difficult it is to make a cartoon when they try to animate Michael and Aaron. S04E46 BBCYFSHIPBDAY 08/12/2017 Beast Boy and Cyborg celebrate the anniversary of their friendship. S04E47 Beast Girl 19/02/2018 As the Titans deal with Madame Rouge, Beast Boy is excited to meet his female counterpart Beast Girl. S04E48 Flashback (1) 30/03/2018 A flashback reveals how Robin changed from a mild-mannered sidekick to form the Teen Titans and become their quick-tempered leader. S04E49 Flashback (2) 30/03/2018 The continuation of a flashback that reveals how Robin changed from a mild-mannered sidekick to form the Teen Titans and become their quick-tempered leader. S04E50 Bro-Pocalypse 28/05/2018 When the male Titans are injured, Raven and Starfire must become bros to stop the Bropocalypse. S04E51 TV Knight 3 25/06/2018 Batman is more interested in watching TV than participating in his birthday party. Ce DA est génial. Complètement WTF, cette interprétation de la bande de jeunes super héros surveillés par leurs ainés plus connus est tout bonnement hilarante. C'est hyper coloré, un montage sous acide, un dessin simple et un chara design juste génial. Envie de parler de Teen Titans Go! ? Les discussions sont là pour vous. Retrouvez toutes les informations sur Teen Titans Go! lancée en 2013 : synopsys, casting complet, acteurs, scénariste, réalisateur. Découvrez des séries similaires à regarder également. Faites vous une idée de la série grâce à la note des membres et aux critiques des internautes.